$50 Old Navy Gift Card Giveaway | A Savings WOW! With the warm weather here, it’s time to refresh your wardrobe. 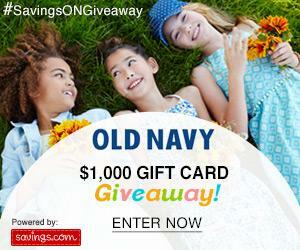 Savings.com is giving away $1,000 worth of gift cards to Old Navy! Twenty (20) winners will receive a $50 gift card to Old Navy!